Picture this: you’re wearing off-white linen clothes, barefoot on a pristine private beach. It’s partly cloudy outside with a light breeze while you sip your mimosa; the gentle waves of the ocean lick the legs of the chaise lounge chair you’re sitting on as the lime green VW bug drives by with that brightly colored sunflower in the dash. What music to set the scene? Why, Wayne Hsu of course! (Where else would I have gone with this?) Wayne has an ultra-chill, jazzy, members-only club style that serenades your ears with some island flavor. A sweet guitar with a sprinkle of percussion complements Wayne’s voice that gives his music a very So Cal feel. It makes you want it to be July all year round and well, living on a tropical island couldn’t hurt either. He might have a wide variety of instrumentation on his EP, but he doesn’t overdo it. A dash here, a touch there; not all guitars and not all drums – it’s a nice collection. All the tracks on A Boy Named Hsu are love songs though. So if you’re emo, great! If not, the songs are beautiful, don’t get me wrong, but the lyrics are sappy and very lovey dovey, so hopefully this will prepare you for what you will hear. “Life and All Your Worries” and “Gettin’ Dizzy” are classic lounge picks and retain all characteristics of that of jazz clubs, minus the depressing sad stuff since these songs are happy and loveable. So if you’re smitten at the moment, these songs will bring smiles and if you’re in relationship woes, well don’t pay too much attention to the lyrics then. The music alone is relaxing, enjoyable and will keep your toes tapping. Now if the pubic is accepting of this acoustic beauty amongst its commercial pop explosions, now that Jack Johnson has subdued to his Hawaiian resort, then everything is golden for Wayne Hsu. 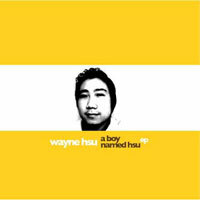 Take some time and preview the EP at www.myspace.com/waynehsu. The EP will go on sale later this month at www.waynehsu.com.